Passeig de Colom is the name of a wide avenue lined with palm trees in the city of Barcelona, Catalonia, Spain in the Ciutat Vella district. The street runs eastwards from the Columbus Monument to the Central Post Office and was constructed from 1878 onwards when the former sea wall was demolished. At number 6 Passeig de Colom is the House of Cervantes, where the famous writer Miguel de Cervantes lodged during his stay in Barcelona. The building dates from the 16th century. In the adjacent square, dedicated to the painter Antonio López, you can find the Central Post Office which was designed by the architects Goda and Torray (1914). Inside the building there are paintings by Francesc Galí and Josep Obiols which decorate main hall. 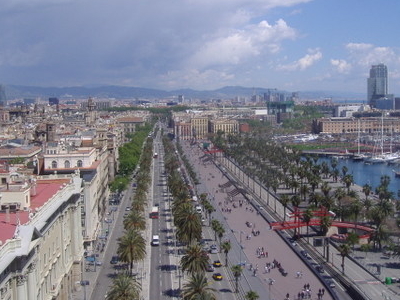 Here's the our members favorite photos of "Famous Streets in Barcelona". Upload your photo of Passeig de Colom!